The Law Offices of Bradford L. Jefferson never charges for consultations and will not receive a fee unless he is successful for you. An accident can be devastating. Physical and emotional injury, medical expenses and lost income. Bradford L. Jefferson has 40 years of success in representing thousands of accident victims in obtaining the compensation they deserve. Bradford L. Jefferson has vast experience in representing surviving families recover fair and just compensation for the loss of a loved one due to the negligence or wrongful act of another. He understands the emotional and financial impact of such a tragedy and will seek justice for all survivors. Any trauma to the head can result in a traumatic brain injury (TBI). The symptoms may be subtle or severe. Victims need professional help and a lawyer experienced in handling brain injury cases. Brad Jefferson has the expertise and experience in successfully handling brain injury cases. 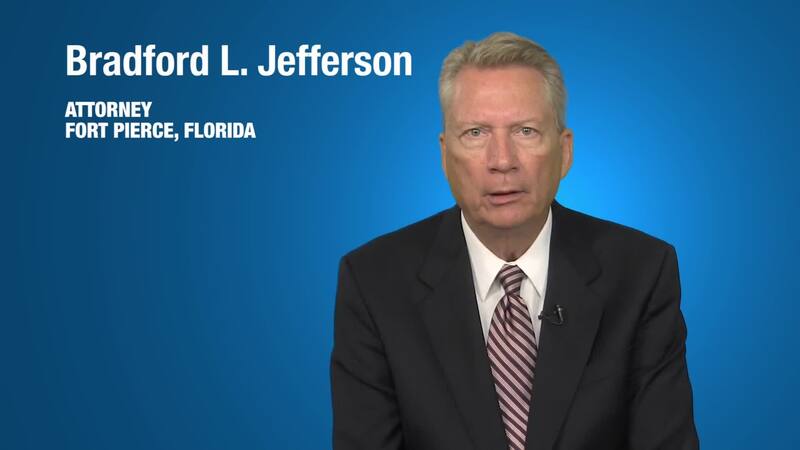 Based in Fort Pierce, Florida, Bradford L. Jefferson, P.A. is an experienced attorney providing representation to clients throughout the Treasure Coast of Florida in cases of serious personal injury and wrongful death. For information about our firm's specific areas of expertise, visit our practice areas overview. Firm principal Bradford L. Jefferson has over 35 years of experience practicing law, and takes on each new case with the expectation of taking the matter to court in order to obtain a favorable result. This approach places each of our clients in an advantageous position whether the case ends in court or in a settlement, and has earned Mr. Jefferson a reputation as a superior trial lawyer with a track record of trying over 200 cases to verdict. In recognition, Mr. Jefferson has been awarded Martindale-Hubbell's coveted "AV" peer rating, the highest possible rating an attorney can receive, indicating exceptional legal ability and the utmost ethical standards. In addition, he has also been included in Martindale Hubbell's Bar Register of Preeminent Lawyers. We utilize the latest technology to make our services as efficient as possible, and offer contingency fee arrangements, meaning we do not collect a fee unless we obtain a favorable result in your case. To find out how we can assist you with your personal injury case, contact Bradford L. Jefferson, P.A. today for free consultation. Brad Jefferson represents injury victims and those who have lost loved ones on the Treasure Coast of Florida with offices in Fort Pierce, Florida. Mr. Jefferson has tried hundreds of cases and has a number of record verdicts obtained for his clients and is recognized by insurance carriers. Because of his reputation of success in the courtroom, most cases settle without having to go to court. The Law Offices of Bradford L. Jefferson offers free consultations on all cases.